This week in the forest we have had a lot of artistic fun using a range of mediums. A group of children were given clay and some time to explore it – how it felt or smelt and some children made links to previous experiences and asked “is it playdough?’ We really love it when we see children try and assimilate what they are experiencing into knowledge they already have and we discussed how clay is made from mud and we compared the clay to the mud in our base camp. Does it feel the same? How does it smell? Children then became really busy making clay sculptures on the trees. Many made some wonderful faces, complete with googley eyes and decorated with autumnal leaves and chocolate wrappers. The children discussed their creations “I made my mummy” “I made a lion” and one child was very proud to show us her three-eyed alien! An adventure walk provided a good opportunity for the children to use photography as a means to capture their experiences. The children were given some time to play around with the camera and as we walked, their work became a little more focused – they began discussing things they were noticing and using the camera in interesting ways to capture these memories. These included a birds-eye view of some mushrooms, a view of the tree canopy from lying underneath the trees as well as a close up of a hole under a trunk that we think may be the home of a night time animal…or monster! 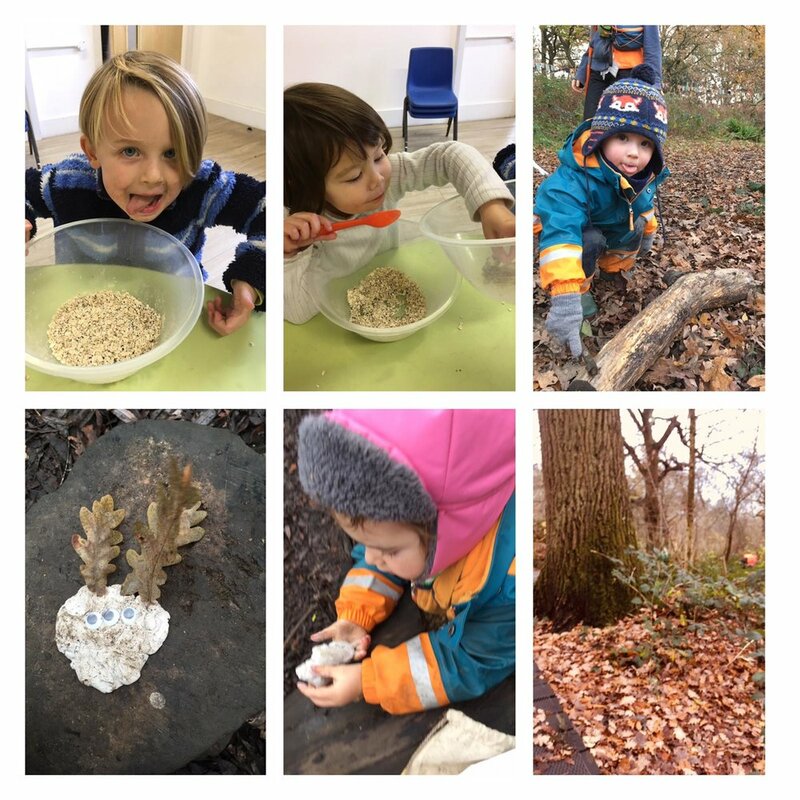 The Little Forest Folk used the photographs to help share their adventures with their friends when they returned and we hope to follow on with more photography opportunities if the children remain interested. With a windy day prohibiting us spending a day in our glorious forest, the children have indulged in a little indoor fun that has included cooking overnight oats, pillow and blanket fort building as well as a very active story time session where children dressed as a character and then made contributions to a group story. So if your children ask for the story where Batman and Elsa save the day, it won’t be found on the bookshelf!